This one has a small story to it. You know, this is the valentine week so we are feeling a little mushy and feel like sharing! M: From last 3 Sundays, we have been having the same veggie soup - like every-time. I know it's healthy but don't we need a break? N: Not every meal can be interesting, some routines are good. M: Naah, not this one, please! N: Hmm, ok ok, I promise - this was the last time we are having this soup in these winters. And to top it off, I will cook something interesting on our healthy-too Mondays. Fine sweety (mush word of the week) ? So to live by the promise I made these rather straight forward Mexican stuffed peppers. They came out really delicious and are a perfect week-night dinner in terms of calories as well as time taken to cook. 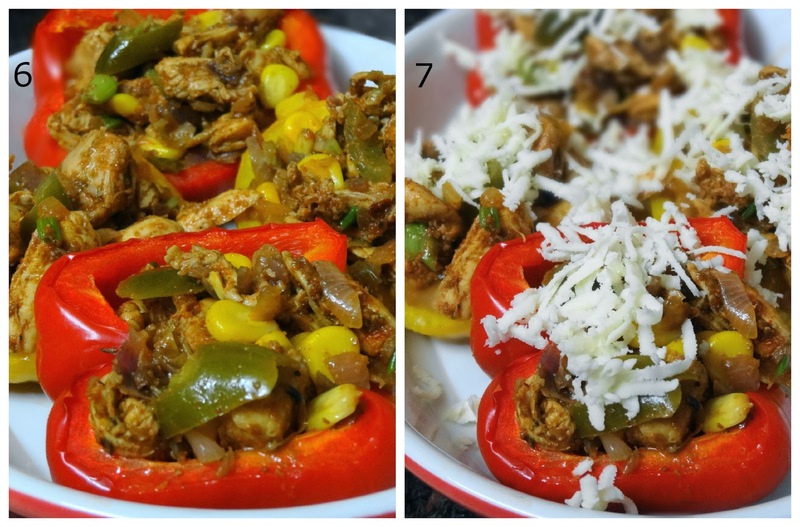 We used chicken, but one can stuff them with cottage cheese / paneer as well. Just note the spice mix we used to make it flavourful. Hope you enjoy cooking this and serving your better halves! 1. In a foiled baking tray, bake bell peppers after spraying olive oil for 20 mins in oven at 200 degrees. 3. 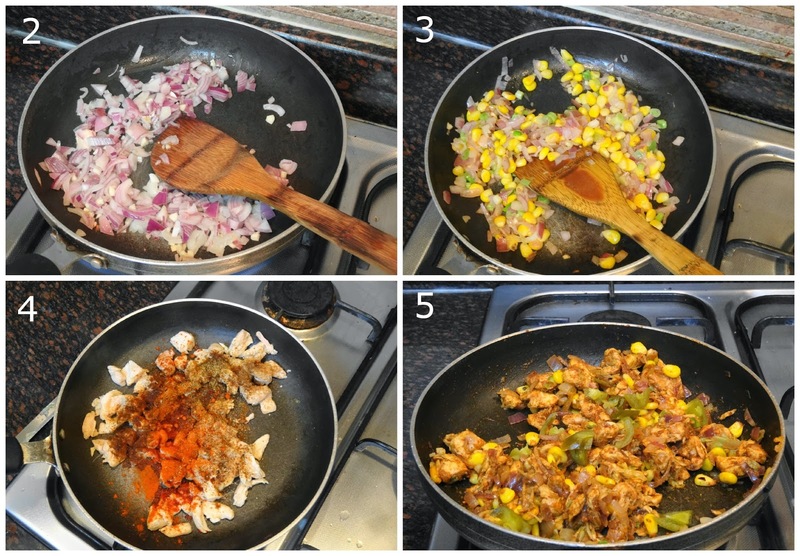 Once the onion starts to brown, add sweet corn to it and then set aside till you cook the chicken. 4. Cook the marinated chicken for 2 mins in the same pan. We don't want to cook much since this will also get grilled. Take it off heat and shred chicken in small pieces. 5. Combine the shredded chicken with the onion and corn mix and also add the jalapeños. Add Taco seasoning, brown sugar, white pepper, salt as per taste. 6. Stuff baked peppers with the filling prepared and bake for 7 - 10 mins. 7. Add some cheese to it and bake for another 5 mins. Serve these juicy stuffed bell peppers with salsa!